Monday 5 May was a significant day in our monitoring calendar as it was the start of our bathing water sampling season. Probably one of our most enjoyable sampling programmes as it’s not every day you can go to the beach for work! More importantly though it’s about making sure members of the public can safely enjoy their time at the beach. 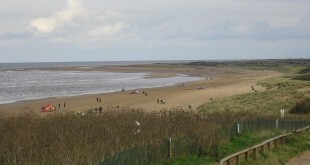 In the patch I work in, we monitor three designated bathing beaches between King's Lynn and Old Hunstanton. Planning the monitoring programme is quite a challenge. Taking a water sample involves our staff entering the sea and taking samples at a specific depth. We have to plan when we do this around the tides which in our patch are complicated further by The Wash, which influences tide times quite considerably. It means that one day we could be sampling at 9am but other days not until 1pm. Our monitoring programme has to be agreed upfront with Defra, to ensure we meet specific monitoring criteria. In 2012 a revised European Bathing Water Directive was introduced, which means that we assess the water quality of a bathing beach using data gathered over a four year period rather than one year. This change means that a beach has to achieve consistent results over a more sustained period of time making the new European standards harder to maintain. Next year (2015) will be our first year for classifying all our beaches for their water quality i.e. good, poor, excellent. So what do we monitor for? We are monitoring the level of bacterial contamination, specifically Intestinal Enterococci (human pathogens from sewage) and Escherichia coli (E Coli). If these are swallowed in high concentrations, the bacteria can cause health problems for bathers. We also do a visual check on litter, animal faeces, sewage debris, unknown lingering foams, tarry residues, seaweed, phytoplankton, marine algal blooms and any unusual pollution – all of which gets reported. The bacterial samples have to reach our laboratories within 24 hours to start the analysis. If this deadline is missed we have to discard the sample. We must then retake the sample within five days of the initial sampling date otherwise the sample will not be included; so as you can imagine ensuring this is done can be challenging especially if weather or tides are not suitable. You can find out more about the quality of your local bathing water on the Environment Agency website.